Mounting brackets designed for 38999 Series II connectors feature captive stainless steel locking nuts, which provide a safety measure that prevents loose fasteners from falling into susceptible areas, which may cause equipment failure. Optional sealing screws with O-rings will effectively seal the mounting holes on your enclosure from water ingress. 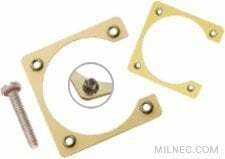 38999 Series II Type Hermetic Wall Recept.